6 Major Direct Product Exits - PolyCath cardiovascular balloon catheters 1990, TALENT stent graft for aneurysm repair 1998, Percutaneous Heart Valve 1999, Pro-Cell Stem Cell Delivery Catheter 1999, MyoCath Stem Cell Delivery Catheter 2005, Bioheart Muscle Stem Cell For Heart Failure IPO 2008. * Leonhardt Ventures legally operates since 2005 as Leonhardt Vineyards LLC DBA Leonhardt Ventures. The Leonhardt Venture's Cal-X Stars Business Accelerator, Inc. FOCUSED Portfolio = 15 cardiovascular + 15 social good impact startups. 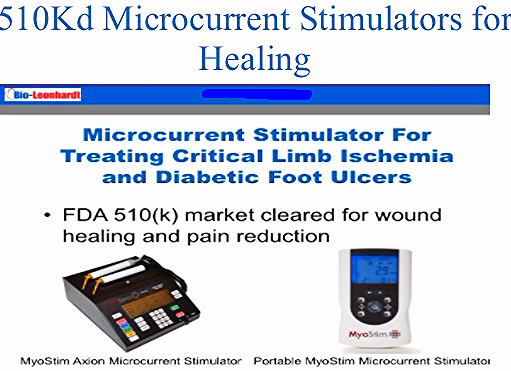 510K FDA Market Clearance secured for MyoStim Axion Microcurrent Stimulator. Completed first North American Clinical Pilot Study patients with success for foot ulcer treatment. Published 47 patient Phase II clinical study conducted in Germany and Switzerland for micorcurrent treatment of diabetic foot ulcers. 95% healing @ 8 weeks achieved. Filed provisional patent application for Stem Cell Bra and initiated pre-clinical studies. Prepared provisional patent application for VALVUBLATOR - device to allow pts to keep their own heart valve instead of getting an implant. Presented cardiovascular portfolio at over 20 major meetings. Launched MyoStim Axion Microcurrent Stimulator at VIVA and VEITH Peripheral Vascular Meetings. Launched sales program for NI Medical @ home heart failure monitors via HeartScore. 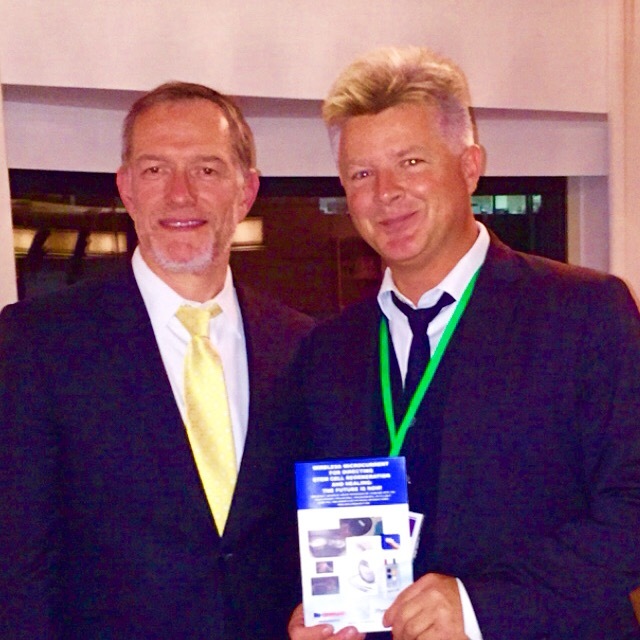 We were a keynote speaker at The World Stem Cell Summit in San Antonio. DentaCell, Cerebracell and EyeCell launched as microcurrent regeneration healing spin outs. Top Social Good Impact Portfolio Highlights 2014 & 1st Quarter 2015. 5th Wine Country Baseball Classic player Brandon Paulson signed to $250,000 contract with the Minnesota Twins. National press received - completed 5th season of play - www.winecountrybaseball.com - over 450 fans attended the 5th Annual Wine Country Baseball Classic in Healdsburg July 4th with fireworks after the game. Crowdfund The American Dream TV show sold to NBC is set to air on CNBC as soon as Title III of crowdfunding law is implemented by the SEC. PRETAIL the Crowdfunding Fashion Co. is launched - crowdfunding pre-sales of new fashion designs. Leonhardt Ventures is covered in Huffington Post and Free Enterprise LA STORY: Santa Monica takes Startup World By Storm. Howard Leonhardt served as a semi-finals Judge for the Richard Branson Extreme Tech Challenge. 1. 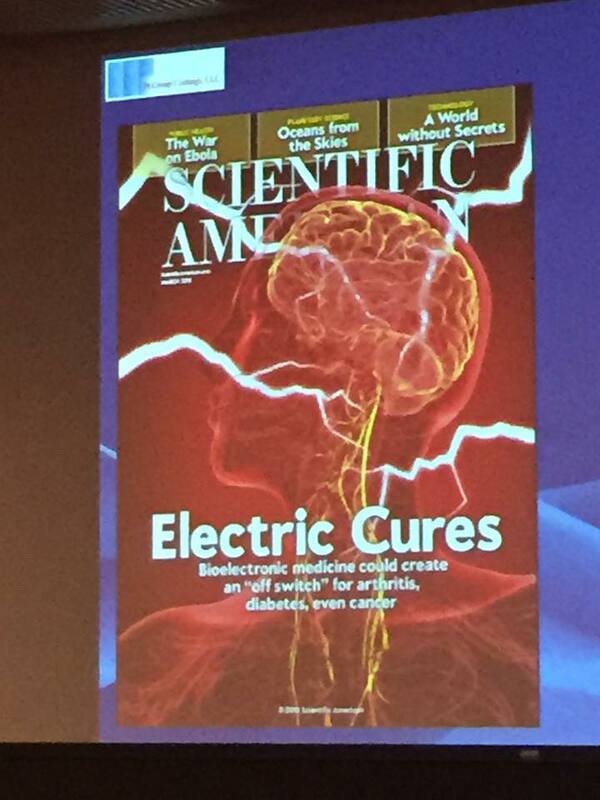 Microcurrent supported stem cell based regeneration and healing. 2. Implantable pumps, catheters & sensors. 2. 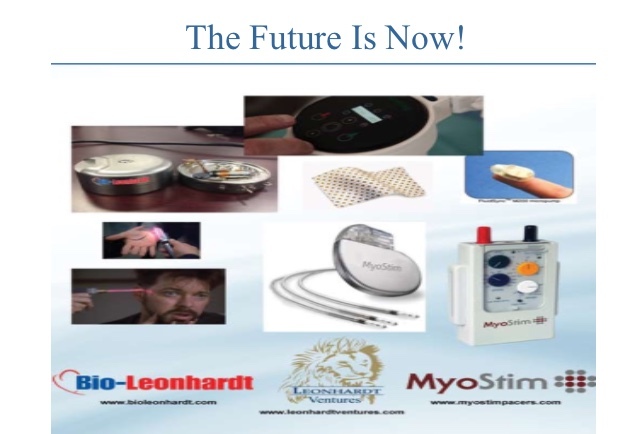 MyoStim Pacers - www.myostimpacers.com - microcurrent stimulators for heart muscle regeneration and limb salvage/diabetic foot ulcers. 4. Valvublator - www.valvublator.com + http://www.leonhardtventures.com/valbulator.php - endovascuar device for decalcifying and regenerate damaged heart valves so a patient can keep their own. 5. AortaCell - Non-invasive wireless energy device for strengthening aortic necks to improve stent graft sealing and for fully healing small aneurysms. 6. STEM CELL BRA - www.stemcellbra.com - world's first breast tissue growing women's bra with built in stem cell homing signal to help recover cancer lost tissue. 7. CoroStim - world's first vibrational energy node for pacemakers to prevent arterial plaque formation in high risk arteries. 8. EndoCell - post athrectomy stem cell and microcurrent repair of damaged arteries - peripheral and coronary. 9. CerebraCell - http://www.leonhardtventures.com/cerebracell.php - regenerative microcurrent treatment for brain trauma and stroke recovery as well as cerebral aneurysm repair. 10. EyeCell - http://www.leonhardtventures.com/eyecell.php - regenerative microcurrent and stem cell treatment for eye diseases and conditions. 11. DentaCell - http://www.leonhardtventures.com/denta-call.php - regenerative microcurrent and stem cell treatment for dental gum and teeth bone healing. 12. Bioheart, Inc. - www.bioheartinc.com - leader since 1999 in stem cell repair of damaged hearts, leg ischemia and vet biologic treatments. 13. HeartScore - www.heartscore.co - cardiovascular genetic tests and @ home monitoring for personalized care of heart failure patients. Publisher of the HeartScore Ranking List of Top 100 Cardiovascular Innovations of the Year. 14. 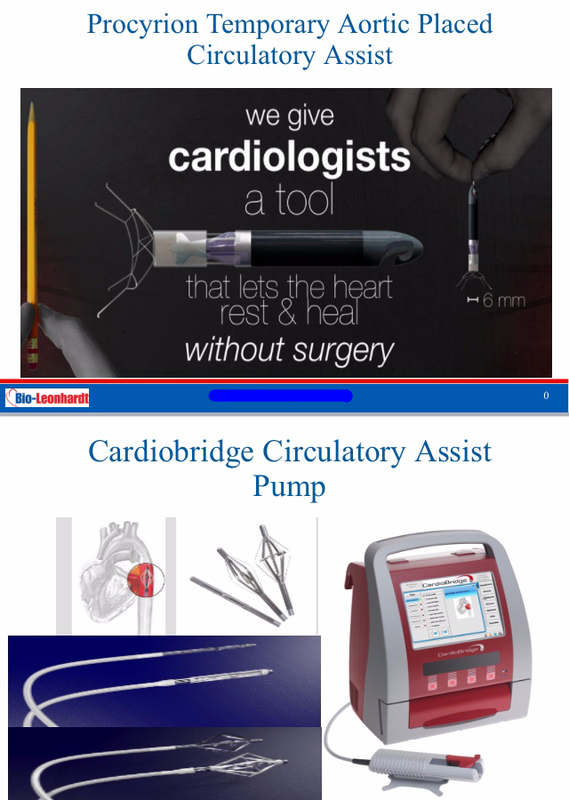 Cardiobridge USA - www.cardiobridge.com - circulatory assist pump on an aortic catheter for acute decompensating heart failure recovery and limb perfusion for limb salvage. Note - No direct cash investment made yet in Cardiobridge Germany. Note - In 2014 & 1Q 2105 we attended over a dozen cardiovascular and stem cell regeneration focused conferences including: Heart Failure Society of America, ACC, JP Morgan Healthcare, VEITH, VIVA, 29th 30th Annual Interventional Cardiology Snowmass, Interventional Cardiology San Diego, Heart Failure LA. At most of these meetings we held a side technology showcase for our full portfolio including Bioheart, Inc.
Loredana Violeta - Leonhardt friend spreading social good impact message. 2. Social good impact innovations including social good impact media. 1. The Kindheart Lionheart TV Network - www.kindheartlionhearttv.com - INSPIRATIONAL WORKS TV TV network with 14 channels (see below), 100s of programs, billions of viewers. Includes the original programs California Love, Love Roller Coaster, Love Dialogues, The LIONS DEN and Dolphin Smiles. 4. 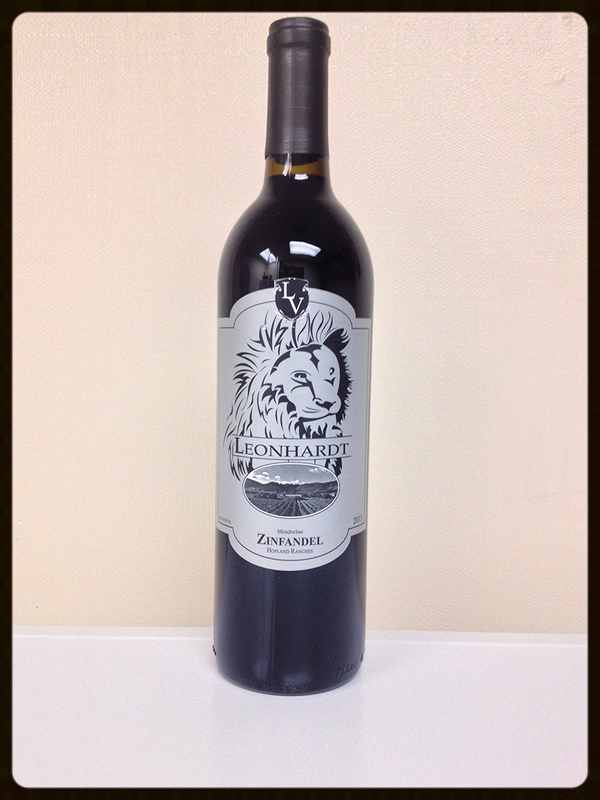 Leonhardt Vineyards - www.leonhardtvineyards.com - gold medal producer of California wines since 2000 sold primarily through Trader Joe's. 10,000 case production in 2014. Note - The wine co. is not in the Cal-X Stars Accelerator. 6. Cal-Xport - www.cal-xport.com - the "alibaba" for California exporters. Helping California exporters develop foreign sales. 11. Kindheart Lionheart Media & Publishing - www.kindheartlionheart.com - retailer, publisher, promotor and creator of inspriational books, abstracts, TV, movies and music. 14. V-Leonhardt Bus Service - super high end bus service matching the best cross Atlantic first class airline cabins with high speed internet and full array of OFFICE ON THE GO services launching in Los Angeles and San Francisco Bay Area. 15. CROWDFUND The American Dream TV Show - set to air on CNBC as soon as SEC finalizes the Feb. 2014 published crowdfunding rules. Produced by Go Go Luckey Productions - http://gogoluckey.com/. Co-created and co-hosted by Clifford Cohen and Howard Leonhardt. Signed contract to co-host. 2. Social good impact innovations. 1. Cal-X Stars Business Accelerator, Inc. - www.calxstars.com - 5 year accelerator focused on cardiovascular and social good impact innovations - 15 cardiovascular and 15 social good impact startups being accelerated in current class. 2. Cal-Xelerator - www.calxelerator.com - 15.5 week (108 days create to great) startup launch accelerator focused on cardiovascular + social good impact including social good media. Prepared new patent application for SDF-1 expression homing signal. Secured manufacturing partner in Los Angeles area. Developed clinical research plan working with Dr. William Abahram, Chief of Heart Failure at Ohio State University following the MIRACLE clinical trial design used by Medtronic for CRT pacing in 2000. A trial in which Dr. William Abraham was Principal Investigator. Arranged grant supported research study at Utrecht University in The Netherlands with Dr. Eric Duckers and Dr. Pieter Dovendans. Recruited Joel Hirsch, past-President of Alfred Mann's Core Manufacturing to lead the manufacturing of these heart repairing pacemakers in Los Angeles. Recruited Suresh Gurunathan former Director of Engineering at NanoStim to serve as Senior Advisor Pacer Engineering. Recruited Jane Reedy former Director of Clinical Affairs for Thoratec and HeartWare to serve as Senior Advisor Clinical Affairs. Got MyoStim Pacers, Inc. stock offering of $1 million via Cal-X Stars Business Accelerator, Inc. legally registered 506c Title II Placement Memorandum listed on the HealthiosXchange board. Obtained CE Mark Approval for Wireless Microcurrent Healing Device - contract produced in Denmark - www.wetlinghealth.com. Duly obtained North America exclusive distribution rights. U.S. 510K application is in process. Obtained marketing sales rights to Microcurrent Sock for Diabetic Foot Ulcer patients - U.S. 510K Authorized to Market. Completed numerous microcurrent proof of utility and safety validation studies working with Dr. Jorge Genovese at the University of Maimonedes in Buenos Aires, Argentina. Completed first clinical patients with successful results for treating limb ischemia and foot ulcers at the Regenerative Medicine Institute in Mexico. Recruited Dr. Jorge Genovese as Director of Electrical Stimulation Regeneration Research. Secured agent to locate distribution partner, research collaborators and investors in in China. Secured distribution partner in Greece. Secured distribution partner in Italy. Secured distribution partner in Turkey. Secured agent to locate distribution partner, research collaborators and investors in Japan. Trained 60 U.S. sales reps on U.S. 510K products. Recruited Dr. Nicolas Chronos, Chairman of Cardiovascular Research at The University of Georgia to serve as Director of Clinical Trials Design. Posted over 100 pre-vetted supporting proof of utlity studies on MyoStim web site. Recruited 35 person Scientific Advisory Board made up of world leaders. Arranged grant supported research study at Karolinska Institute with Dr Ulf Hedin for treating critical limb ischemia and diabetic foot ulcers. Established program at UCLA Business of Science Center where students can conduct research work for MyoStim, get paid minimum wage and gain Ph.D. level college credit, working within the UCLS CNSI Laboratories. Arranged access to UCLA CNSI Laboratory space for lab experiments at low cost. Recruited Paul Meyer as interim CFO advisor. Recruited Jeremy Koff of Alfred Mann Companies to team- http://www.calstockexchange.com/team-view/jeremy-koff/ as a senior advisor. 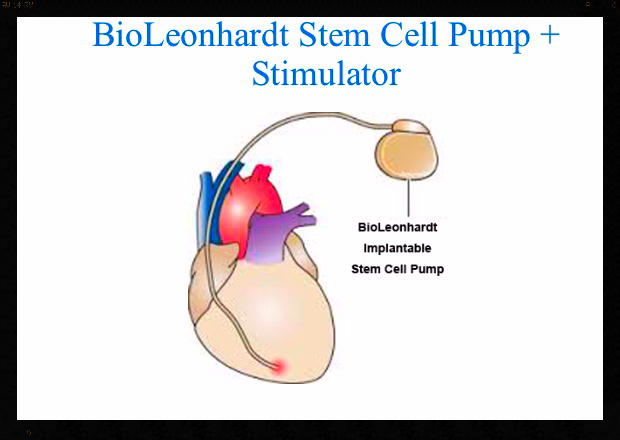 BioLeonhardt www.bioleonhardt.com - Implantable, programmable, re-fillable stem cell & growth factor pump combined with electrical stimulation for damaged heart muscle regeneration and limb salvage. Unveiled product at 9th Annual Cardiovascular Cell Therapy Meeting in New York. Prepared 4 related patent applications for filing. Created web site introduction video. Initiated research collaboration with Dr. Eric Duckers and Dr. Pieter Doevendans Urtrecht University, The Netherlands. Developed protocols for regenerating damaged heart muscle in advanced heart failure patients. Developed progressive aggressive limb salvage protocol. Developed working alliance with Fluid Synchrony makers of micro infusion pumps with IP estate www.fluidsynchrony.com. Fluid Synchrony is approaching $2 million in SBIR grants and $70,000 in revenues. 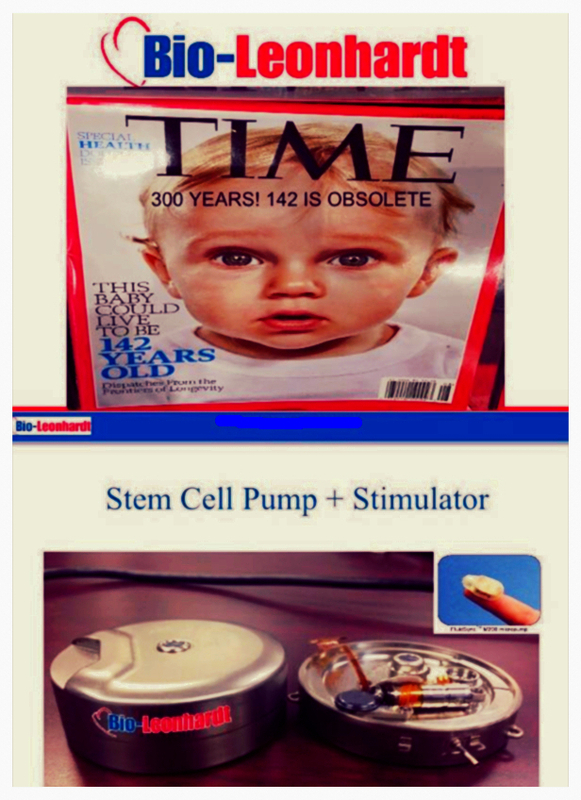 Presented at World Stem Cell Summit Dec. 2014. Presented at 30th Annual Interventional Cardiology Meeting in Colorado. On the bottom of front page of www.bioleonhardt.com are two slide decks with additional data. Developed revenue pathways in to vet clinics and research labs (pre-clinical). Stem Cell Bra www.stemcellbra.com - World's first women's bra with built in electrical stimulation homing signal for stem cells with ability to differentiate them into breast tissue. Filed two provisional patent applications. Solidified research alliance with Dr. Joel Aronowitz of Cedars Sinai UCLA. Initiated large animal study in Argentia with Dr. Jorge Genovese. Prepared for human clinical trials to begin 2Q 2015. Add dozens of supporting papers to web site. Valvublator - http://www.leonhardtventures.com/valbulator.php + www.valvublator.com - first catheter based device for decalcifying, cell sodding, surface modifying and microcurrent regenerating heart valves so a patient may keep their own heart valve instead of getting an implant. Prepared a provisional patent application ready to be filed. Developed research collaboration with Dr. Mark Cunningham, Chief of Staff Cardiac Surgery at USC Keck Medical Center. Developed research collaboration with Constantinos Anagnostopoulos a medical device researcher and engineer in England. Developed protocol for preserving a patients own heart valve without surgery. Presented Valvublator at 30th Annual Interventional Cardiology Meeting in Colorado. See www.valvublator.com for supporting science slide deck. Prepared provisional patent application for catheter based delivery. Developed disolvable cone design for percutaneous placement. Developed research collaboration with former Alfred Mann Companies member with sensor experience. Prepared provisional patent application ready for filing. Developed research alliance with Dr. Warren Sherman, Director of Cardiovascular Stem Cell Research Columbia University. Secured contract supplier for adventia needle catheter - Mercator Medical Systems. Secured manufacturing partner for microcurrent healing device. Developed pre-clinical and clinical study plan. AortaCell â€“ Non-invasive wireless energy device for healing aortic aneurysms, strengthening aortic necks in stent graft cases and sealing Type III endoleaks non-invasively. Prepared three provision patent applications for filing. Developed research alliance with Dr. Ulf Hedin at Karolinska Institute in Sweden. Developed manufacturing partner for microcurrent devices. Granted 4% of seed stage equity to research and kids funds on behalf of co-Founder Dr. Roy Greenberg, former Chief of Vascular Surgery of Cleveland Clinic that passed away last year at age 49 of cancer. DentaCell - http://www.leonhardtventures.com/denta-call.php - Microcurrent devices for healing dental gums, teeth and jaw bone. Developed management team to move forward product development. Develop pathway to partnerships for wireless microcurrent dental strips for healing = ProCellera and Posifect (final contracts pending sales forecasts). 510K FDA authorization has been received for Procellera microcurrent bandages and CE Mark for PosiFect. Secured manufacturing partner for wireless microcurrent devices - Wetling. Applied for CE Mark for wireless microcurrent wound healing. 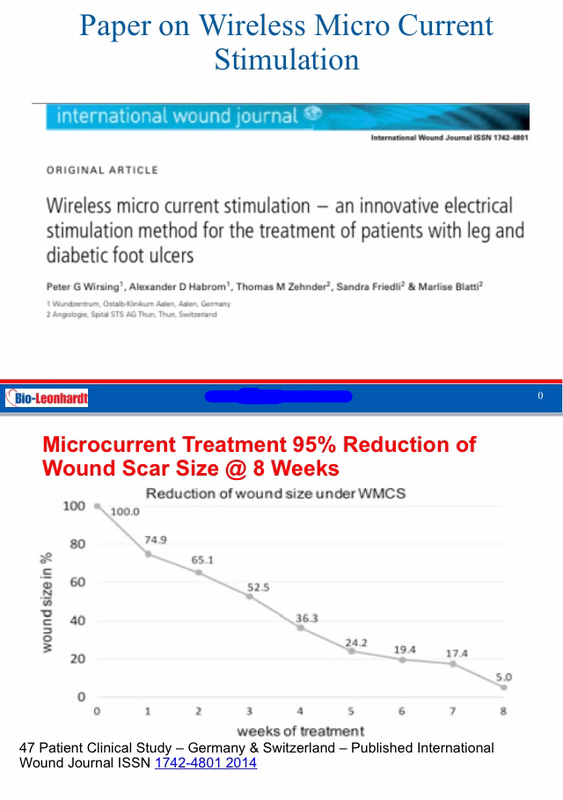 Prepared 510K application for wireless microcurrent wound healing. Secured manufacturing partner for wire based microcurrent device with 510K. Began development of bone healing stimulators specialized for teeth. Established registered tooth pulp storage service for future stem cell expansion in case of need. CerebraCell â€“ http://leonhardtventures.com/cerebracell.php - Microcurrent device for helping patients recover from brain trauma and strokes. Signed up Hall of Fame QB Dan Marino to introduce us to the NFL. Secured investment from the University of Northern Califonria Foundation. Placed CerebraCell in Leonhardt's Launchpads @ UNC STIC Incubator near Santa Rosa, CA. EyeCell - http://www.leonhardtventures.com/eyecell.php - Microcurrent device for reversing macular Degeneration and for treating other eye disorders. Partnered with renowned eye surgeon Dr. Patrick Johnson of Minneapolis. Recruited Dr. Edward Kondrot renowned expert of microcurrent eye related therapies to research team. Placed EyeCell duly in Cal-X Stars and Leonhardt's Launchpads at UNC STIC incubators in Santa Monica and Santa Rosa. CoroStim - Vibrational energy device for preventing plaque formation in arteries. Prepared provisional patent application for filing. BioPace - http://www.leonhardtventures.com/biopace.php - Biological pacemaker made of living cells placed via a percutaneous needle tipped catheter. Completed enhanced cell culturing studies in The Netherlands. Developed research collaboration with Dr. Eric Ducker Utrecht University The Netherlands. Initiated research collaboration with Dr. Jakub Tolar University of Minnesota Stem Cell Research Institute. Developed research collaboration with biological pacing pioneer Wendell King. HeartScore www.heartscore.co - Full lineup of cardiovascular diagnostics including genetic tests and @ home and point of care monitoring for developing individualized care for heart failure and cardiovascular patients. Publisher of the soon-to-be published HEARTSCORE TOP 100 CARDIOVASCULAR INNOVATIONS OF THE YEAR. Developed sales partnership with NI Medical heart failure monitors - http://heartscore.co/nimedical/ - placed 2 evaluations units in leading U.S. centers. Recruited 60 cardiovascular sales reps in the USA. Launched @ home ECG monitor. Launched full lineup of cardiovascular genetic tests. Developed special working relationship with Heart Genomics www.heartgenomics.com a heart failure genetic test co. Developed special working relationship with ProStem the ischemia blood test co.
On Deck Circle (means no investment made yet but helping to showcase and planning to invest and/or collaborate in the future). Circulatory assist pump on a catheter. Presented results from European trials at numerous conferences. Prepared application for CE Mark. Developed plan for U.S. sales launch. Began preparation of U.S. 510K application. Procyrion - www.procyrion.com - Circulatory assist pump on an aortic stent. Progressed pre-clinical studies in preparation for FDA application to begin clinical studies. The California Stock Exchange - www.calstockexchange.com - Aspirations to become 1st U.S. social good impact stock exchange - under development. Secured registered Trademark for The California Stock Exchange TM. Prepared documentation for the Cal-X Social Good Impact Fund Business Development Corporation IPO to be filed 3Q 2015. Developed promotional collaboration with the Poliwogg Regenerative Medicine Fund BDC IPO. Prepared the Cal-X 30 Social Good Impact Index Fund/Exchange Traded Fund for informational ticker tape listing and test run before full real money launch. Cal-X Crowdfund Connect - www.calxcrowdfund.com - Crowdfunding campaign building services firm launched. Launched PreTail the Crowdfunding Fashion company - http://www.calstockexchange.com/crowdfunding-fashion-pretail/ - Crowfunding pre-sale site for fashion designs. Serving as state spokesperson for The JOBS ACT and CROWDFUNDING for Startup California have now given over 70 speeches. Cal-X Stars Business Accelerator, Inc. - www.calxstars.com - 5 year business accelerator specializing in cardiovascular and social good media innovations. Accelerated progress of 15 cardiovascular and 15 social good impact startups. Secured 125 stakeholders - 20 shareholders and 105 compensated advisors. Cal-Xelerator www.calxelerator.com - 108 day startup launch accelerator. Leonhardt's Launchpads www.leonhardtslaunchpads.com - Incubator for select few life science companies at University of Northern California Science & Technology Innovation Center. Sapheon Medical that incubated at UNC STIC sold for $238 million to Medtronic Covidien. V-Leonhardt Bus Service â€“ High end super high tech bus service for major cities. Finalized prototype bus design and developed build out budget. 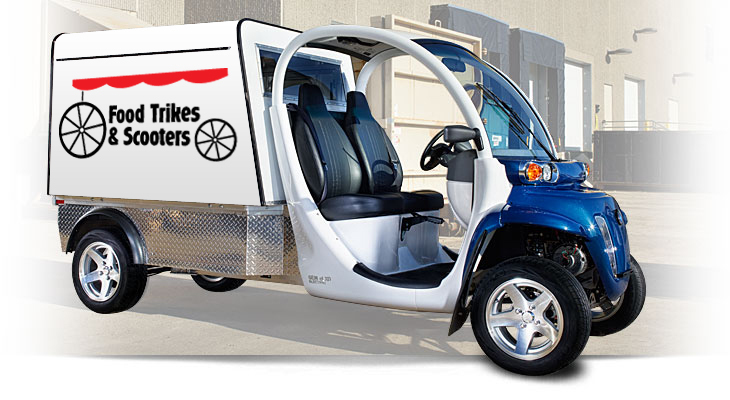 Food Trikes and Scooters www.foodtrikesandscooters.com - Solar powered mini food trucks supported by full array of services. Built out and sold first unit. Developed sales brochure and web site. Wine Country Baseball www.winecountrybaseball.com + http://www.leonhardtventures.com/wine-country-baseball.php - Development league for showcasing players hoping to get signed to MLB contracts. Had over 400 fans at 5th Annual Wine Country Baseball Classic on 4th of July in Healdsburg. WCB Classic participant Brandon Paulson signed to $250,000 contract with Minnesota Twins. Over 300 WCB Posters put up all over Sonoma and Napa County for Wine Country Baseball Classic. Secured local radio coverage of games. Developed franchise sales package. Franchises selling for $80,000 each. 12 teams in inventory. Cal-Xport - http://cal-xport.com/ - The â€œAlibabaâ€ site for California exporters. Promoted UCLA export education programs. Developed TRIP MATCHING SERVICE to help exporting companies make overseas export sales calls at less expense. Working on developing easy to use APP. Posted dozens of helpful resource links. Kindheart Lionheart Media & Publishing www.kindheartlionheart.com - Online book store â€“ inspirational works. Publisher, creator and producer of inspirational content. Over 500 GET INSPIRED books posted in retail store. Advanced forward Dolphin Smiles: The Legend of Kindheart LIonheart via UCLA Writing Program. Produced first short film - Melody. Spun out a TV network with 14 channels and 30+ programs with over 1000 episodes. Crowdfund The American Dream TV Show - Crowdfunding show sold to CNBC. Sold to Go Go Luckey Productions. Signed contract to co-host show. Gained placement on CNBC primetime. Kindheart Lionheart TV Network - www.kindheartlionhearttv.com - Inspirational works TV network. Over 30 programs with over 1000 episodes. Posted shows have over 2 billion views total. Created 4 original in-house original programs. Kindheart Lionheart Startup Media Support Services http://kindheartlionheart.com/startup-media-support-services/ - Media marketing and ad team to help launching startups. We take part cash and part equity for pay for services. Primarily producer of company videos. Developed full service studio for producing TV shows, ads, music videos, company videos and short films. Radio Veronica USA - https://www.facebook.com/radioveronicausa + www.radioveronicausa.com - Online radio station set up to crowdfund the publishing rights of songs with one tap of your phone. The Kindheart Lionheart Radio Show - http://www.leonhardtventures.com/khlh-radio.php - Radio show focused on stories of compassion and courage in the marketplace in the era of conscious capitalism. Aired 14 episodes covering stories of compassion and courage in the marketplace, innovators and creators. Kindheart Lionheart Adventures - www.lionheartadventures.com - Charitable giving travel company and set of products to help foundations raise funds. 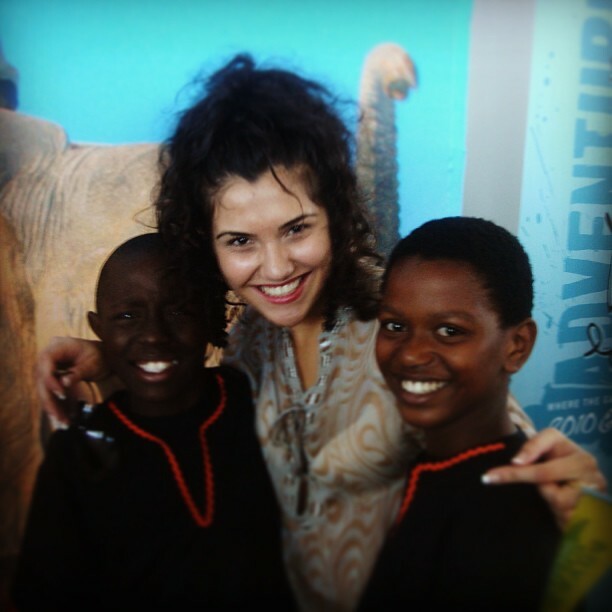 Arranged over 24 exciting charitable giving and foundation fund raising adventure pacakages. California Love TV Program - http://www.california-love.co/ - The flagship original TV series of the Kindheart Lionheart INSPIRATIONAL WORKS TV network. About the first moments of new love. California Wine Financing Partnerships - Financial services company supporting the wine industry. Financed the sale of over 1800 cases of wine and secured rights to grapes and production capacity for 6200 additional cases working in partnership with Commercial Finance Group. Startup California www.startupcalifornia.org - Startup support services. Over 100 interns signed up into summer startup internship program. Upgraded the Startup Jobs site. Posted over 4000 posts of information helpful to startups. LA BioHub - www.labiohub.org - Life science information hub with plans for a physical incubator in near future for the Los Angeles area. Lucille's Cafes Franchising & Licensing Co. -http://www.leonhardtventures.com/lucilles-cafe.php + www.lucillescafes.com - Holding company that holds trademark, franchising, SOPs and recipe rights for the highly successful Lucilleâ€™s Cafes. Completed franchise package for restaurant. Designed Lucille's on Wheels Food Truck. Developed Lucille's on Wheels full menu. Developed Lucille's on Wheel's Mini Food Truck design. Developed Lucille's on Wheel's Food Trike design. Entrepreneurship Party Public Policy Institute - www.entrepreneurshipparty.com - Public policy institute to support entrepreneurs. 9th year of advocating for entrepreneurs. Over 73 speeches so far on crowdfunding and the JOBS ACT. The Task Runners - www.thetaskrunners.com - Task completion services for Los Angeles businesses and busy people. A working partnership no equity stake at this time. Follow us on Twitter at @howardleonhardt, and Linkedin. Copyright Â© 2015 Leonhardt Ventures/ California Stock Exchange, All rights reserved.